2016 – Op-Geo Throws Collection. These Jacquard Loom woven afghans will keep you cool on the beach and warm on the couch. 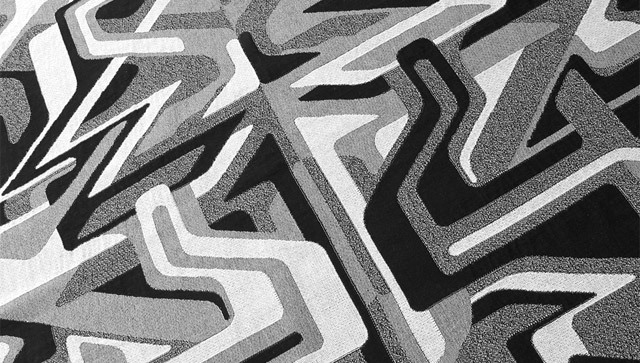 Full range of 10 different Op-Art designs by Matt W. Moore. This large terrarium takes indoor gardening to a new level of luxury and splendor. Constructed with 3 choice hardwoods: White Oak, Mahogany, and Black Walnut. Vented Lexan Polycarbonate windows. Solid Copper tray will patina and age beautifully over time. Top may be rotated slightly to provide ideal humidity levels. Forage native plants or bring the tray to a specialist for a more exotic assembly. 2014 – Ceramic Tiles Collection. Three new tri-tone geometric designs in this year's collection of ceramic tiles. Ideal for indoor & outdoor use including shower install, kitchen backsplash, entryway flourish, or simply use as coasters for guest's drinks. The asymmetry of each tile's design allows for infinite configurations. Rotate each during install for a randomized look, or create your own pattern grid by aligning choice corners. A captivating optical illusion from any angle. This unique table is constructed with 3 choice hardwoods: White Oak, Mahogany, and Black Walnut. Mortise and tenon construction. Built to last. The combination of masterful woodworking and timeless geometry make this piece stand out and demand a closer look. 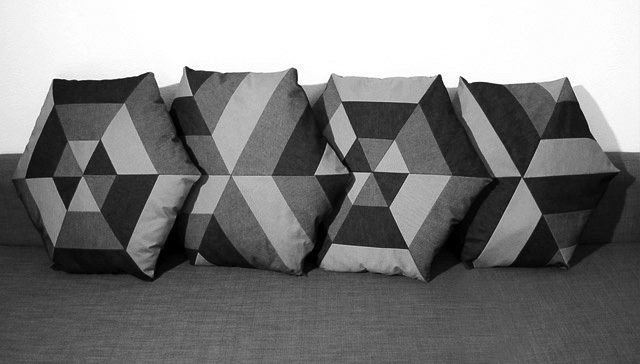 Unique patchwork hexagonal pillows constructed with three different solid denim tones. Each pillow is made up of 18 panels on the front with a single backing. Durable and built to last. Available individually or as set. Hexy & comfy. New Jacquard Loom woven afghans, each with it's own distinct aesthetic. Symmetrical on the vertical axis, these quadtone designs are inspired by classic Rorschach Tests. Bold and memorable forms. Clean and timeless greyscale. Fits two comfortably sunning at the beach, or shawl-ify on a brisk evening. Choose your own adventure! 2011 – Ceramic Tile Coaster Set. Timeless geometry is alive and well... on your coffee table. These ceramic tiles come as a set of 4, each with it's own diagonal graphic design. Place them together for a large teapot. Or break them apart for your guest's drinks. When they're not in use have fun shifting them around to make different Op-Art arrangements. Enjoy! 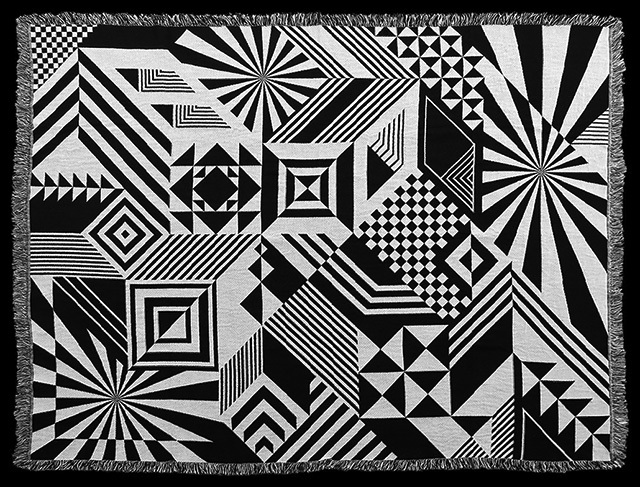 These Jacquard Loom woven afghans will keep you cool on the beach and warm on the couch. 3 different Op-Art graphics. "Crystal" features a faceted triangulation array, "Ripple" celebrates a melting topographical map aesthetic, and "Archery" is a skewed mosaic of the MWM logo.